8000 B.C. Native Americans were confirmed to be living in Vermont. 6000 B.C. Archaeologists say that Indians camped at John’s Bridge site to hunt and fish. 800 B.C. Western Abenaki people confirmed living in Vermont. 1609 Samuel de Champlain claimed the eastern shore of Lake Champlain for the Crown of France. 1613 Tradition among the St. Regis Indians has it that a Catholic priest visited the Swanton area. 1682 The Missisquoi Abenaki village was in existence. A mission existed for a shor time at the Missisquoi Abenaki village. 1687 Peter Schuyler, a commissioner of Indian affairs from Albany, wrote that River Indians visited the Abenaki Village at Missisquoi on their way to Montreal. 1704 Missisquoi Abenakis and French Militia radied the English settlement at Deerfield, Massachusetts during Queen Anne’s War. 1723 Waranoki Chief Gray Lock built a stone fort on the banks of the Missisquoi. 1730 A plague struck the Abenaki and French villages. The Abenakis went ot St. Francis, returning only for the hunting season. 1734 A grant, covering the Swanton area, was give to Phillipe-Rene le Gardeur de Beauvais, Jr., July 20. The French occupied Swanton Falls. 1736 The Abenakis returned to the Missisquoi village. 1740 The first white settlement at Swanton Falls was perhaps the first European settlement in Vermont. 1741 Grants reverted back to the Crown Domain because improvements were not made to the land, May 10. 1743 An Abenaki mission was established at Missisquoi. 1744 Nicolas Rene Levasseur, a ship builder for the governor of Quebec, visited the settlement of Missisquoi. 1748 Sieur Nicolas-Rene Levasseur was granted the Seigniory of St. Armand “six leagues front along th River Missiskoui, by three leagues depth on each side of the latter.”, September 3. A sawmill, trading post and village was established at Taquahunga Falls (this is now Swanton Village). 1749 The Seigniory of St. Armand (grant approved by the King did not include the area along the banks of the river where most of the Indians resided) was ratified by the King of France on April 30. 1750 Tradition has it that a stone chapel was built at the Missisquoi Indian Village about this date. Some say it was 1700. some believe there was no church. If there was one it would have been the first Catholic church in Vermont. 1754 Nicolas Rene Lavasseur built a sawmill at the falls and a stockade was built on a nearby hill. The French and Indian War began. 1758 The Abenakis, under Montcalm, arrived at the Battle of Fort Carillon (Ticonderoga) but they were too late to save the fort. 1759 Rogers’ Rangers passed through the Missisquoi Bay. New France surrendered to Great Britain in September. Most of the French withdrew from this area. The English sent 200 men to destroy the Vilalge and sawmill, October 5. 1760 Captain William Swanton fought at the Battle of Louisburg, Nova Scotia. Levasseur returned to France. 1762 Town was furst surveyed by William Brasier. 1763 Canada was ceded to England by the French and the Treaty of Paris designated the 45th parallel as the boundary dividing Canada and the Colonies, February 10. Levasseur sold his Seigniory of St. Armand to Henry Guynand, a merchant in London, November 17. Benning Wentworth, Royal Governor of New Hampshire, issued a grant for 23,040 acres of land to be called Swanton, August 17. 1764 The King of England, settling a dispute between New York and New Hampshire, on July 20th ruled that all land west of the Connecticut River came under the jurisdiction of the Province of New York. 1765 James Robertson, a merchant of St. Jean, Que., got a lease of a substantial amount of land for 91 years from the Abenakis and within three years established a sawmill on the site of the former French mill, June 13. 1766 Henry Guynand sold his title to the Seigniery of St. Armand to Benjamin Pierce, James Moore and George Fulton, May 23. 1771 Governor Dunmore of New York granted 30,000 acres of land to Simon Metcalfe and his wife. This land was called Prattsburgh and is now part of Swanton and Highgate, July 6. 1774 The area around Swanton, Sheldon, and Fairfield was called New Rutland in the New York Land Patents, September 8. 1775 American Revolution (1775-1783). Most of the Abenakis had left the Missisquoi village. 1776 A saw mill was built. It was burned, possibly by men employed by the Allens. 1777 The New Hampshire Grants declared Vermont as an independent republic called New Connecticut, Jan. 15. Dr. Thomas Young of Philadelphia recommended the name Vermont to replace New Connecticut, June 7. First constitution of Vermont, July 2-8. 1784 Ira Alien purchased fifty-nine of the sixty-four shares of Swanton at a sheriff’s sale. 1786 John Hilliker is believed to have come here about this date, leased 100 acres from the Abenakis, and became the first permanent white settler in Franklin County. 1787 Ira Alien employed William Cott to survey the town. John Wagoner, Adams Mills, Orange Smith, Michael, Henry and Stephen Lampman, John Nokes, John Hoyle, Lemuel Laselle, Thomas dark, and Conrad Asselstyne were some of the early settlers. 1788 John Hilliker II, first white child born in West Swanton, July 17. 1789 Thomas Butterfield, agent for Ira Alien, had the first dam built at the Falls. It was swept away before completion. 1790 Town government organized, March 23. New York gives up claim to Vermont. Lemuel and Elias Lasell completed first dam at the Falls. 1791 George W. Green was the first white child born in East Swanton, March 15. First grist mill at the falls was erected by Ira Alien, March 4. Vermont became the 14th state. The population of Swanton was 74. 1793 Asa Holgate erected the first hotel. by John’s Bridge, 1796 The first marriage took place between William Crocker and Percis Hardley, January 2. The first Baptist Church was organized at East Swanton. 1797 A U.S. Customs office was established. Stephen Keyes was Collector of Customs. The town was divided into school districts. 1798 The first religious meeting held in town was in Levi Hathaway’s barn. 1799 The first frame house was erected by Rufus and Elisha Barney. 1800 IronwasmanufacturedbyElishaandRufusBarney. Lime was manufactured. The first merchant, Alexander Ferguson, had goods for sale in his home. The population was 858. 1801 The Congregationalists organized, January 4. Silas Hathaway was recorded on the Grand List as having the only watch in town. 1802 Elisha Rood built the first framed house along the river. 1803 Jonathan and Elijah Ferris bought 5,OOO acres of land from Silas Hathaway for $22,000. This included all of the land where the village now stands. The first school was taught by Lydia Hyde, in a corn-house belonging to Levi Scol onVe west side of the river. The first Post Office was established in Swanton. 1804 John H.Burton was appointed as the first postmaster at Swanton Falls, January 1. 1805 A ferry operated at the Falls. The first school house was built. The Capitol was established at Montpelier. 1806 The first Methodist Meeting was held in the home of Levi Scott. Rev. Reuben Harris preached the sermon. A woolen mill was built by Luther Drury. Smuggling was prevalent because of President Jefferson’s embargo on trade with England and Canada. The ship “Black Snake” smuggled potash into Canada and brought back manufactured goods into Vermont. This ship was captured and three government men were killed. 1808 The Ferns house was built. (This burned in 1970). 1809 Eleazer Wheelock of Rutland petitioned for the exclusive right to run stages from Rutland to Middlebury, to Swanton and return twice or more each week. 1810 The line with Highgate and Sheldon was established. The population was 1,657. 1811 “Old John’s (Toll) Bridge” was built by Joseph Palmer. 1812 The first trestle bridge was built at the falls. Joseph Atkinson built the first marble mill. A regiment of eight companies was stationed here and a barracks was erected for drafted militia. The War of 1812. 1813 The middle of the bridge at the Falls washed away. The British, on returning from attacking Plattsburgh, landed 600 men at Maquam and destroyed the government barracks at the Falls. mill on the west side of the river burned. 1815 Walter Scott died at the age of 110. The second school house was built. A union building was erected for the Baptist and Congregational denominations. became a trading center where people from the outlying areas brought in maple products and traded them for fish. There were at least six seines operating in the river. 1817 A union building was erected for the Baptist, Friends, and Congregationalists at Swanton Center. This is now part of a barn owned by Norman and Martha Tarte. 1820 A cotton mill was operated by William Gadcomb at Swanton Hill in East Swanton. S. W. and S. S. Keyes built the first boat in Swanton and named it The Montgomery. The population was 1,607. 1821 Parson’s (Toll) bridge was built at the Falls. Swanton’s young ladies were offered mill jobs at Lowell and Chicopee, Massachusetts starting at $1.00 a week. 1823 The Champlain Canal opened giving Swanton access to New York City and beyond. The Congregationalists, Episcopalians, Friends, and Methodists built a brick church at Swanton Falls. 1824 The village consisted of a meeting house, two school houses, three taverns, five stores, a grist mill, five saw mills, two fulling mills, two woolen mills, four marble mills, a forge, and about 75 dwellings. The whole town included six school districts with school houses, six stores, six taverns, two distilleries, two tanneries, and a pottery. The first service of the Episcopal church was held. 1825 The first Free Will Baptist meeting was held. 1832 The Universalists met for the first time. 1834 The second John’s bridge was built. It was covered. A Poor House was established at Sheldon. 1836 The toll bridge at the Falls became a public bridge. The northern half of Hog Island, which was formerly a part of Highgate, became part of Swanton. The first Catholic church was built on the site of the present church. 1837 Swanton took an active part in the Patriot’s (Papineau’s) War, which was brought about by the Canadians wanting their independence from British rule. 1838 The North American was the first newspaper published in town. 1839 A post office was established at Swanton Center. 1841 A more substantial bridge was built at Swanton Falls. 1842 A temperance society was formed and continued for about fifteen years. 1843 At least ninety-six people from Swanton went to the World’s Fair in Chicago. The Chambly Channel, at the Richelieu River rapids, was completed promoting boat traffic between Swanton and the North. There were 1 681 819 sheep in the state. 1844 Eight stores in town at this time. There was a Superintendent for the seventeen school districts. 1846 A post office was established in West Swanton . 1847 Charles W. Rich manufactured lime at Swanton Junction. This is now called Fonda Junction. 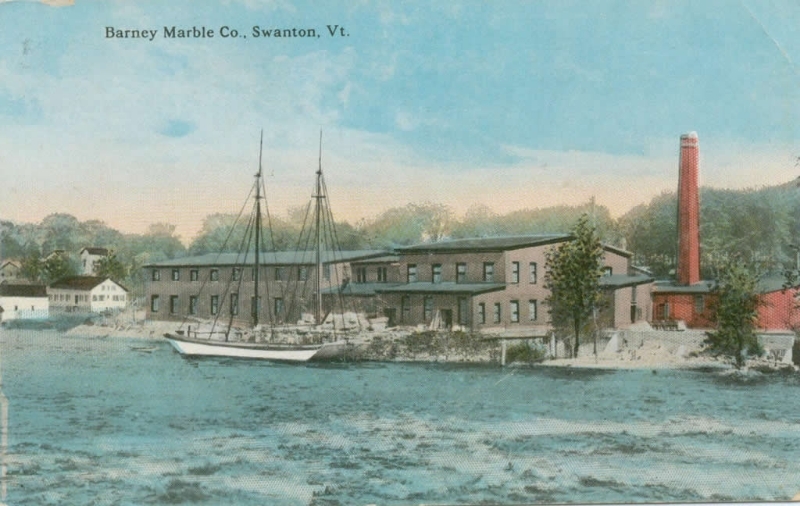 black marble tile made in the United States was manufactured in Swanton. Half of the population of the state was under sixteen years of age. 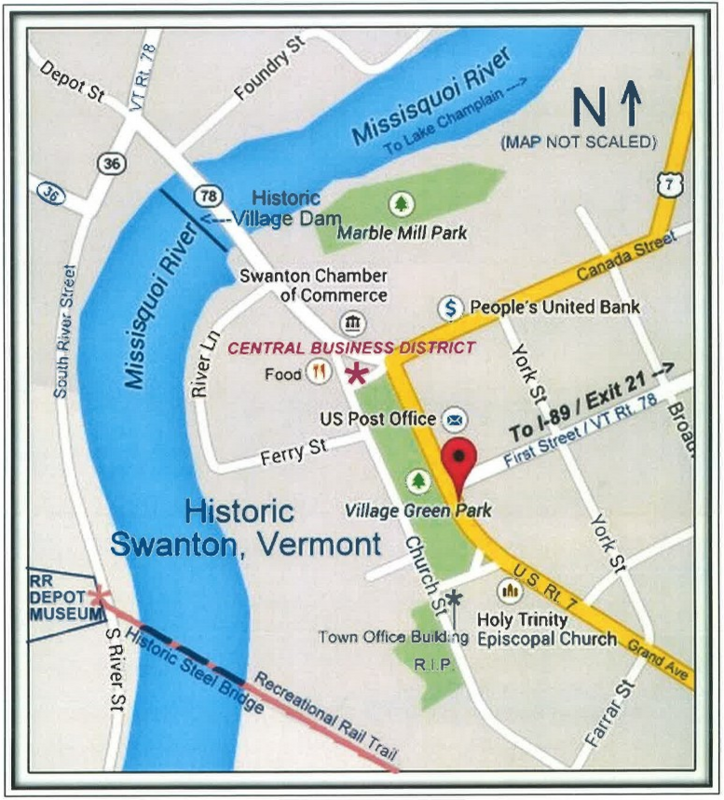 1849 The Vermont and Canada Railway began building at Swanton only one year after the first railroad began operating in Vermont. 1850 On October 18 the first train operated on the west side of town; the first passenger train on December llth. The Union Bank was chartered with capital of $75,000 The population was 2,824. 1851 The Vermont & Boston Telegraph Line office opened. The Town Hall and Academy building burned. 1853 A letter found in a lead tube, in a sand pit on the west side of the river, was claimed to have been written in 1564 by Johne Graye, a sailor who apparently died on the bank of the river. The village now contained 75 dwelling houses, a meeting house, two school houses, five stores three taverns, a grist null, four saw mills, a woolen factory’ and mills for the manufacture of marble. The town contained sixteen schools, eight stores, two tanneries and over 300 acres of marble. 1854 The Catholic Church had its first permanent priest. Forest fires burned for days during the drought. The fire consumed some railroad sleepers. 1855 The drought caused more wild forest fires. 1857 First Catholic school was established. 1858 Turrillo’s Hotel burned. The Catholic church burned. 1859 The second Catholic church was built on the south side of Canada Street across from the present church. The first fire district was formed. 1860 The population was 2,678. 1861 The Civil War took 284 men from Swanton. Thirteen were killed in battle, and twenty eight died of wound and disease. Many were in the Green Mountain Guard which was the first company enrolled in the state. The bodies of about thirty Indians were discovered at a burial ground at the Hempyard which was near the airport approximately under interstate 1-89. 1863 The first passenger train came through the east side of the village. 1864 The St. Albans Raid brought the Civil War a little closer to Swanton. 1866 The Fenians, an Irish secret revolutionary society organized c.1858 for independence from England by force tried to invade Canada from nearby Franklin. The dau industry grew after the Civil War. 1867 Holy Trinity Episcopal Church organized on All Saints Day. The post office at Swanton (Fonda) Junction opened. The St. Johnsbury and Lamoille County Railroad was chartered. 1868 The Civil War monument was sculptured by Daniel J. Perry of Swanton. 1869 A covered bridge was built at the Falls. The J. & O Dorman block, and the C. H. Bullard house were built. The George Blake dwelling was built on Grand Avenue. The Soldiers Monument was dedicated. 1870 Work was started on the Lamoille Valley Railroad. The population was 2,866. 1872 The Missisquoi Railroad, formed July 1, ran through East Swanton, which is now Green’s Comers. St. Anne’s Catholic School opened. 1877 Fire destroyed the old brick store on January 11. It was built in 1806 and was occupied by Jewett and Blak as a grocery store and post office. It was rebuilt by C. W. D. Prouty & Son. William H. Blake commenced work on a eighty by seventy foot two-story fireproof block. Most of Merchants Row was destroyed by fire. The first passenger train came from St. Johnsbury on the St. Johnsbury and Lamoille County Railroad. A steamer was operating from Maquam to Plattsburgh. The Swanton Courier was first published, March 10. The House of Representatives approved $20,000 for the Swanton Breakwater at Maquam, March 30. 1878 Merchants Row burned to the foot of Grist Mill Hill July 15. S. E. Moore invented a corn & bean dropper April 13. 1879 BIRTHS: Fifty-seven (thirty male, twenty-seven female). MARRIAGES: twenty-eight. DEATHS: thirty-nine (nineteen male, twenty female). CAUSE of DEATHS: Diphtheria ten. Consumption seven. Croup three. Kidney complaints three. Pneumonia two, other fourteen. 1880 The steamer Maquam was built at Maquam. The population was 3,079. 1882 Atwood & Willard’s Suspender Manufactory was located on Merchants Row, January. The H.C. Bames block, a sixty-eight by fifty-two foot brick building was built by E. M. Prouty. It was two stories high. Hatch was the architect. Barnes occupied a 28×68 foot store next to the Blake Block. The Post Office was located in this store, April 1. 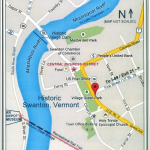 The “Barney” history of Swanton was published in Volume Four of the Vermont Historical Gazetteer. This was written by John Perry and George Barney. Abby Marie Hemenway was the editor. Telephone poles were set up between Swanton and St. Albans and telephones were in use between these points on September 16, six years after Alexander Graham Bell invented the telephone. Twenty-five trains passed the station today and the Swanton Courier said it wasn’t much of a day for trains either. The band was organized with Harlon Bullard as leader. 1883 Edward Lapier, a fireman at the Fonda Lime Kiln, who had been ailing for the past four years vomited a lizard several inches long. Lapier improved, but the lizard died about an hour later, February 10. Due to the poor condition of the ice on the river, the horse trot was run from Hog Island Point to across the bay. Jos Billings, billed as the greatest living button-bursting, side splitting, corset disarranging, laugh-producing humorist, did not show up at Bullard’s Hall. This almost caused a riot. Ed Decker, who lived just outside of Swanton, performed with the Bamum and Bailey Circus. Mrs. H. W. Beals was getting orders for her Rheumatic Bitters from California, New York, Boston, and Albany. 1886 A new Methodist church was erected on the site of the old one which was torn down. 1887 While in route to the Adirondacks, President Cleveland and his wife journeyed from North Bennington to Swanton. The original water system was put in from the river. 1888 Swanton Village was incorporated, November 27. The steamer Maquam made its last regular trip, December 1. 1890 The Golden Rule Circle of the King’s Daughters was organized by Mrs. James Babbitt. An iron bridge replaced the covered wooden bridge at the Falls. The population was 3,231. 1891 Fire totally destroyed the covered bridge and Prout/s Planing Mill. F. D. Lapell operated a grist mill called the Franklin County Mills, June 17. 1893 The Shakespeare Club was organized. 1894 In January the electric light plant was installed at Highgate Falls and Swanton was the first town in Vermont to adopt municipal electric lighting. People’s National Bank was chartered. Portion of village on west side of river was organized as Fire District No 2. 1895 Fire destroyed the Old Central House (this is where the library now stands), the Methodist Church, and the George Barney residence. On May 20 the Messenger headlines read “Seventy-five acres covered with smoldering ruins in St. Albans – greatest conflagration Vermont has ever seen. The Oblate Fathers of the Sacred Heart established at Swanton in September. 1896 St. Edmund’s High School was erected. Methodist church rebuilt after fire of 1895. 1897 The first train on the Vermont & Province Line/Canada Atlantic Railroad operated. President McKinley was a summer guest at the Hotel Champlain at Maquam. 1898 The Oblate Fathers opened an Apostolic school. Eleven Swanton boys participated in the Spanish American War. A 369 foot covered reailroad bridge was built. At one time it was the longest covered railroad bridge in the country. It burned down June 8,1987. The town maintained 16 schools. Swanton had a banjo club. The kindling wood company employed sixty-five people. They ran night and day, and shipped two rail car loads a day. 1899 The sewage system was constructed. 1900 The population was 3,745. 1901 The Electric Street Railway ran from Swanton to St. Albans and St. Albans Bay. 1903 The Kindling Wood Factory burned down. E. K. Smith’s yacht, the Wa-Wa, burned in Plattsburgh Bay. It was fifty-feet long with a ten foot beam, and was propelled by steam power. This yacht was built for a nephew of Andrew Carnegie at a cost of $12,000. 1905 Fire west of the river destroyed Hogle’s Marble Works, the Wead building, and H. N Moreau’s store. 1908 A pipe line was installed to Fairfield Pond for water supply. The Federal Ammunition Company was formed, October 22. This later became the Remington Arms Co. Cranberries were selling for eight cents a quart. 1909 East Swanton was renamed Greens Corners. A monument was erected at the site of the first church erected in Vermont about 1700 by the Jesuits. The Post Office at Fonda Junction was closed. 1910 The population was 3,628. 1911 The Taquahunga Club moved from the Blake Block to the Fen-is House, January 20. The Dreamland Theater offered different pictures every day. The cost was ten cents, and they had vaudeville acts. C. H. Prouty was manager. George Washington died in Swanton on November 18. He was born in slavery in Virginia, and sold from the block when he was one year old. He joined the Northern Army, and served as a waiter. He came to Swanton with Captain Hiram Platt. 1912 The Swanton High School was built, July 30. The Post Office at Greens Corners was closed. 1913 Lyman Tobin, a Swanton lad, made his debut in a leading role on Broadway (New York City, not Swanton), January 9. 1915 Remington Arms bought out the Robin Hood Ammunition Company in June. 1916 The Library was dedicated on February 9. The minimum rate for electricity in town was $8 per year. Hockey was a new game in Swanton. Homer Hungerford was the captain-center of the Taquahunga hockey team who were the champions of the state. The first community Christmas tree was erected on the bandstand in the park. 1917 An explosion at the International Explosives Company, in which its general manager Dr. E. M. Funk was fatally injured, was said to have been the first American death in the United States caused by World War One, March 15. The Pastime Theater, on First Street was gutted by fire, March 26. Corporal Leonard A. Lord was the first Swanton boy to give his life for his country in this war, He was killed in action somewhere in France on April 12th. There was a teacher’s training course, August 30. The Taquahunga Club hockey team were Vermont champs or again. 1918 The International Explosive Company was destroyed in an explosion. Dora Savage, age 20 and Nellie Hemimingway, age 19 were killed, March 28. 1919 Lapelle Poultry Food Co. burned, August 7.
children under twelve were free. The population was 3,343. 1923 The Atwood Suspender Factory at the corner of York and First Street burned down. 1925 The Nativity Parish erected its third church (the present one). 1927 Swanton was hit by a hurricane and a flood. Throughout the state sixty lives were lost, 9,000 persons driven from their homes, and at least $100 million in damage. The Bell Radio Station broadcast a program by the Swanton Citizens Band. The Dorman Block (owned by Dr. C.E. Alien) at the corner of Grand Avenue and Canada Street burned. It was occupied by the Swanton Furniture Company, Customs House, Blais Restaurant, a shoe repair shop, real estate office, millinery store, and the Masons. 1928 The woolen mill was working full time. 1929 On May 3 a tornado hit town strewing timbers over a distance of four miles, roofs were carried off, all the windows in the new marble mill were blown out and the roof was carried away. The railroad station across the river was lifted off its foundation and the roof was taken off the St. J. & L. C. Railway bridge. Two barns were overturned on River Street. All that was left of the sub fire station across the river was the cement floor. The homes of Edward Poulin and Moses Sawyer were left in a shambles. It carried the stable of the Swanton Lumber Co. off, leaving the horses standing there uninjured. An automobile was carried sixty feet and landed right side up on a pile of debris. The tornado only lasted two minutes, but it was followed by a two day rain, and the town was without lights and power for two days. The damage was estimated at $40,000. There were injuries but no fatalities. 1930 The population was 3,433. 1936 Iron pipes were laid to Fairfield Pond for water. 1937 The old Catholic church on the south side of Canada Street was torn down. The Swanton Band disbanded. completed. The Grand Avenue Hotel was torn down. 1940 The population was 3,543. 1941 Three hundred and sixty men and women from Swanton were in World War Two. Eleven gave their lives. 1942 The Missisquoi National Wildlife Refuge was established. The Iron cannon was removed from the village green on November 12 to be used as scrap for defense. 1946 Zenie Mercier bought Leonards Market, Everett Kittell bought Sanitary Market, Paul Burton opened an Esso Station on First and Grand Avenue. The Remington Arms plant, which had been closed for twenty-seven years, became the site of George Yett’s bag manufacturing plant. Swanton is producing MY-T-FINE milk, and Trahans Golden Crust Bread. The last CV passenger train via the east station was on November 24. 1949 The Memorial Building was dedicated in February. 1950 One hundred and ninety-six of our service people were in the Korean conflict. The population was 3,740. 1954 The ground was broken for St. Anne’s elementary school, October 24. 1959 The first Annual Swanton Festival was held. 1892. He came here about 1917, and was foreman of the Public Works Department for about thirty years. Milo Barney died October 21 at age ninety-five. He served the community for many years. 1963 John Barren in his book KGB : The Secret Work of Soviet Secret Agents tells of two KGB agents coming to Swanton to ascertain if there was a rocket base here. Two swans, Sam and Elizabeth, were given to Wanton by Queen Elizabeth to celebrate the 200th anniversary of the Swanton charter. Village Trustee Harold Bliss died. 1964 Two hundered and seventy three of our men and women served in the Vietnam War. A ten room elementary school opened. Village clerk & Treasurer Ray A. Carman died August 20. He served the community for twenty years. The A&P store was built. Champlain Industries went into the Remington Plant. 1965 The Boarder Patrol building was built at south end of Grand Avenue. A ten inch natural gas pipe line was laid through the village. Five and half miles of interstate I89 were completed from the Waite farm to Highgate Springs. Eighty-five acres of land were purchased from Earl & Gladys Cheney on the North River Road for an industrial park. 1967 Ruth M. Riley died August 5. She served many years as Village Clerk. Oren L. Harris died, June 4. He was Village Manager for twenty-two years. Harold E. Spicer newly appointed Village Manager was accidently killed. 1968 Swanton embarks on zoning and joint Village and Town Planning Commission was apoointed. W. Jay Chaffee steps down as Village President. 1970 On January 28, fire destroyed a large portion of downtown Swanton within a week of a fire in Swanton, Ohio. The Missisquoi Valley Union High School opened in Highgate just outside the village of Swanton. Softlight Lamp Company employed over forty people. The population was 4,622. 1972 Village Trustee Charles Chevalier dies. Sewer project in operation in November. The Softlite Company, manufacturer of lamps, completed their building in the industrial park. 1976 Governor Thomas Salmon recognized the Abenaki Tribe and formed a Commission on Indian Affairs. 1980 The population was 5,141. 1984 The Swanton Historical Society organized, March 6. The new John’s Bridge was completed in November. 1987 On June 8 the covered railroad bridge that was built in 1898 was destroyed by fire. Eight people from four states re-enacted teh 1759 military mission of Rogers Rangers. They traveled by boat and afoot. It took them two months. They passed through Swanton on September 16. 1988 The 100th Anniversary of the Village and the 225th Anniversay of the Town.